As the economic recovery continues, it seems that many of the indicators have improved, but the unemployment figures stay stubbornly high. Is the “jobless recovery” for real? It seems that this might be the case, with technology playing a significant role in the challenge. I don’t have a solid case to prove this, but will offer a few comments that might indicate lines of inquiry. In the “good old days,” say 30 years ago, the system of capitalism seemed to work effectively to bring back jobs. The argument goes this way: Those who lead businesses are motivated to make even more money, so in an improved economy they will invest and grow their business. This means more jobs from that business and more money for the investors. Enlightened self interest at work. This logic made sense for many years. But does it still hold? The beauty of capitalism is the way it efficiently and effectively allocates resources. The business leader does not depend on a central planner, or any external master plan. By simply allocating resources efficiently in his or her own business, this will be good for that business and broadly good for the economy. Two things have changed dramatically in the past 30 years: globalization and technology. Some would argue that these factors are not independent — the 21st century form of globalization is fundamentally rooted in technology. Technology enables the efficient coordination and movement of ideas and goods almost anywhere in the world. In this environment, consider what might happen as the economy improves. The motivation to grow the business has not changed. But how to do that has changed. No longer is it simply a matter of adding more jobs to produce more goods and services thus increasing the size of the bottom line. Other potentially more attractive options are open to the business leader to grow the business. One would be to invest in an overseas plant, creating jobs in another part of the world while reducing jobs at home. A second would be to invest in technology enabling the more efficient production of goods and services also leading to a reduction of jobs at home. A third would be to buy a competitor, streamline the operations, and reduce a significant number of jobs. There is nothing wrong with these investments — they make great sense according to the principles of capitalism. Further, most consumers, voting with their pocketbooks, endorse these ideas. When confronted with a purchase of two equally attractive shirts of similar quality, for example, most choose the one with the lower price. That is a vote for the business that introduces more efficient solutions leading to lower priced products. This is not big, bad business eliminating jobs, this is business responding to the demands of the market. And it is not a knock on capitalism — it represents capitalism doing what it does best. Job growth was never what capitalism was about — it was a byproduct of the efficient allocation of resources and the self interest of growing the business. But perhaps the tight correlation between economic improvement and job creation is less than it used to be under capitalism in this technological era of globalization. “Another challenge comes from technology itself. There will likely be more and more skilled joblessness as technology provides efficiencies in work. Some jobs are capable of being expanded, involving services and new ideas. But even as these grow, technology eats up a middle range of jobs that require a modicum of intelligence and a certain amount of training. So today, you have to be faster and more intelligent than a computer, or intelligent in different ways than a computer, in order to retain your job. Fewer jobs will be needed because more jobs will get automated away. “The purpose of a company is not to create jobs …. “OECD economies are simultaneously experiencing a wave of technological change, intensified international interdependence, and social cohesion problems caused by prolonged unemployment or stagnant wages and incomes in parts of the population. Technology is increasingly seen as the main source of long-term growth. It is a major force for the transformation of economies, for growth in productivity, as well as for the creation of jobs and an enhanced quality of life. It is also the fundamental driving force behind globalization, which represents a huge potential for gains from intensified exchange, specialization and learning across countries. At the same time, technology is widely blamed for the destruction of jobs …. What we see in the chart is unemployment beginning to rise in late 2007, reaching a peak two-and-a-half years later and dropping only minimally. Meanwhile the Dow dropped precipitously from its October 2007 peak to its low in March 2009 but has regained most of its losses by the current time. The GDP slowed its growth and actually dropped in 2008 before returning to modest growth. It is true that there are often lags in hiring after economic downturns. But it is clear that companies of the DOW, at least, recovered economically without strong hiring. If it is indeed the case that job growth does not follow from economic growth and investment, at least as much as it used to, it should cause us to reconsider several planning assumptions that underlie policy. To increase job availability, more attention needs to be paid to nurturing the development of small businesses, since large business investment may or may not develop jobs. Those who advocate not raising taxes for big business and high net-worth individuals because it would stifle job creation may need to find another rationale. Some would address the issue of job growth by seeking to limit globalization or efficiencies from technology. This, too, would be a mistake. The impact of such actions on competitiveness in an increasingly integrated world would be worse than the lack of local job creation. Job growth is important for a flourishing society, and it will take some new, creative approaches to make this happen in the face of global, technologically based capitalism. 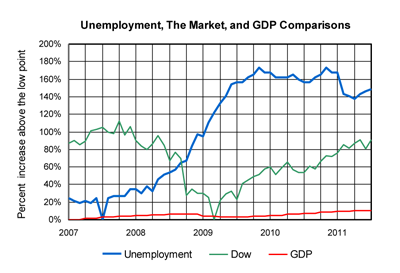 1 The data for this graph was derived from data provided by the Bureau of Labor Statistics (unemployment data), the Bureau of Economic Analysis (quarterly GDP data), and the Dow Jones Averages using data from the first week of each month. The vertical axis for the graph represents the percent of increase from the low point during the period. The high point for the Dow was slightly more than a 100 percent increase compared with the low, while the high point for unemployment was about 180 percent above the low. One word that reoccurs again and again is “growth”. The idea that growth needs to occur in all sectors seems to be assumed as a “given”. The word that never occurs is “sustainability”. I believe that we need to think more deeply about the long term relationship of growth and sustainability – both in our general economy and the job market. I have also heard it said by commentators that this is a male recession. Male unemployment is higher than female unemployment. Such data could therefore be used to suggest that males are the problem. Instead of isolating a single dimension to the situation we need to identify the multiple overlapping dimensions. What we see happening is that there is a reconfiguration process across industries and countries. In previous generations technology encouraged large scale corporations with a production line mentality. Despite the appearances with a few mega corporations at the top of every industry, the current generation of technology is encouraging flexibility, niche specialisations and relationship building, skills women have traditionally developed probably in response to problematic corporate cultures that have limited their opportunities. We are dealing with a complex phenomena with technology faciltating change (communications) but also with technology as a product giving opportunities to new economies to break in to previously largely closed trading networks. While it is obviously a huge personal challenge for those in the USA caught in this change, that should not be diminished, it is also worth remembering that in recent decades the global poverty situation has improved. As the comment above implies the question is: can we work towards an understanding of wealth and poverty that acknowledge that we only have one planet but we need to help millions more people meet the needs of everyday life. Wondering if anyone reading this article has thought about these issues in relation to Tyler Cowen’s book The Great Stagnation. The basic idea reflects what Al is saying here, but as a corollary to a bigger idea: we just aren’t coming up with the same kind of fundamental innovations we did during the last quarter of the 19th and first half of the twentieth century. When you think about those innovations: distributed electric power, aviation, the automobile, HVAC, refrigeration, modern sewage disposal et al it’s apparent they carried an inherent necessity to their demand, and economies of scale in both production and consumption made sense. IPhones and such are nifty, but the great majority of their added value is at the margins, and disproportionately aid people who are an SD or two above the mean in IQ and/or have access education and other resources. They just don’t change life in the fundamental way a flush toilet and a refrigerator do if you didn’t have those things. So on this reading the difficulty isn’t simply technology, but the kind of technology we’re producing. If we were in an “increasingly integrated world”, you would be right. Regretfully, we live in a world that is integrating in a skewed way. What do I mean? We are integrating in finance (where the field is most level – but, even there, not level enough), we are integrating in production (and here the field is fairly obviously skewed – with production moving to countries with minimal if any standards of health, safety, care for the poor or for the environment) and we are integrating in research (with a lot of investment going to areas with minimal or no standards in ethics). However, the world is not integrating in services, and it is not integrating in the area of human migration (“foreigners” are still foreigners, and are systematically discriminated against). The result is that jobs that have been created, millions of them – but created in developing countries, while developed countries face the prospect which you present correctly (and which I have been drawing to people’s attention for a very long time). So we need to move rapidly to full integration. Otherwise the political and social problems caused both in the developed world and in the developing world will rapidly drive us into at worst war and at best a full-scale retreat from globalisation – which would be an enormous pity (I should also say that I have argued that the march of technology can and should be slowed down in any case – see my article on robots at http://www.theglobalist.com/storyid.aspx?StoryId=5084). When I present the alternatives in the way I have just done, people think that I mean to include a world currency and a world government. Nothing could be less desirable. Currency competition and compeition in political systems are both essential if freedom of choice is to continue – in other words, if human beings are going to continue to have the possibility of being human.